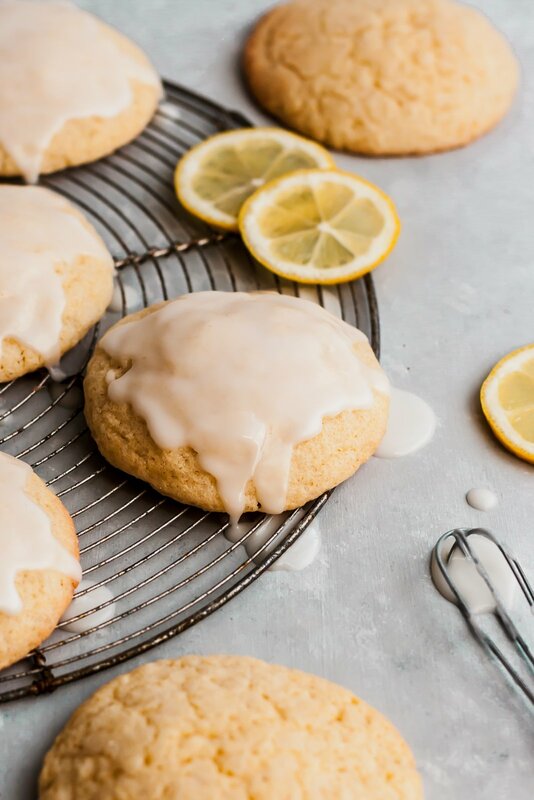 These lemon cookies are soft in the middle with crispy edges, and are delicious topped with a lovely lemon glaze. Add poppy seeds to these cookies to easily make them lemon poppyseed cookies! Lemon lovers will LOVE these cookies. After a few weeks away from blogging and working on our new site, I’m back and ready to give you ALL of the beautiful springtime recipes! We realized that the site wasn’t set up properly in the blackened which is unfortunate, but because I want it to be an amazing user experience for you, we’re making some big changes before we go officially go live. Bottom line: I’m still not sure on how long it will be, but the good news is that once it’s ready it will be worth the wait. 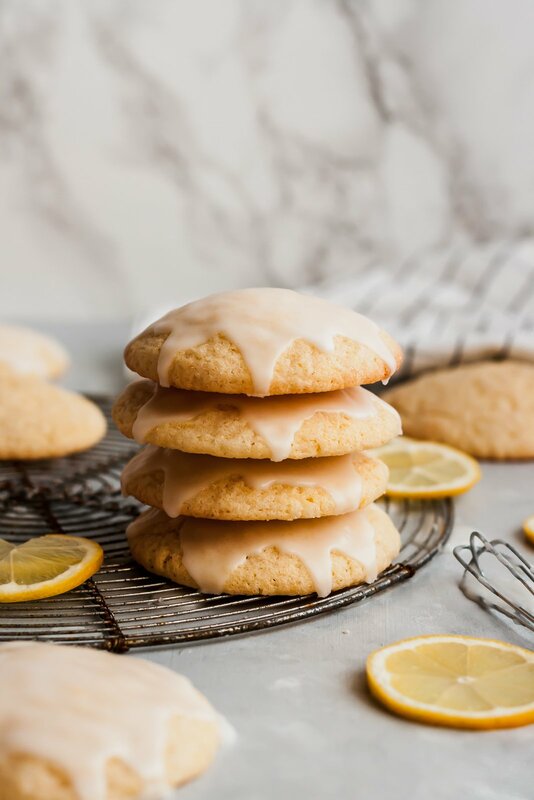 Now, onto these delicious homemade soft lemon cookies that are a combination of a soft lemon cookie and a sugar cookie. Since it’s officially spring and Easter is right around the corner, I wanted to bring you an easy springtime dessert recipe for all of your celebrations usually lemon bars are all of the rage, but why not lemon cookies too? Especially if they’re glazed with a lovely lemon icing. These lemon cookies were inspired by my Italian orange cookies, which aren’t overly sweet, but still full of incredible citrus flavor. 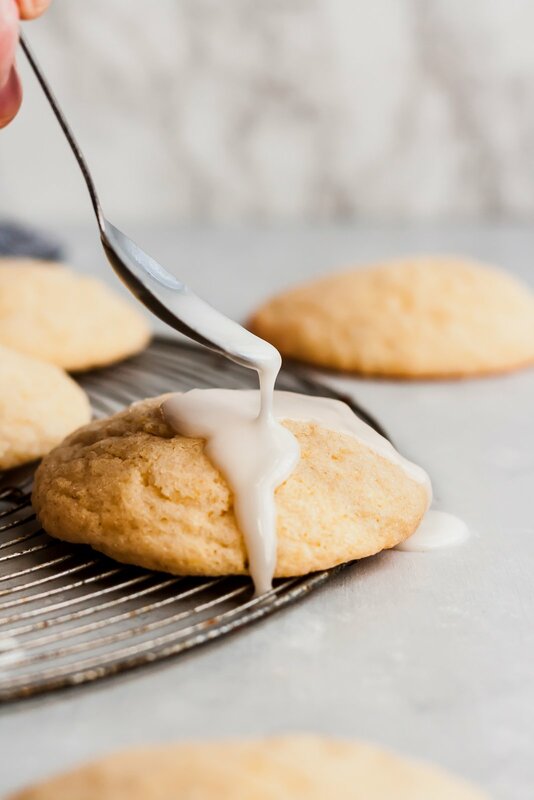 These soft lemon cookies are made from scratch and are a bit different because they’re chewy in the middle, but still give you slightly crispy golden brown edges like a regular sugar cookie. I tested them 5 times to get the absolute perfect lemon cookie, so I hope you love them as much as we do! Flour: these cookies call for regular flour. I do not recommend using any other flour other than all purpose flour. Baking Powder: we’re using baking powder in this recipe because we want the cookies to be both soft and chewy similar to soft sugar cookies! Softened butter: I prefer to use salted butter in my cookie recipes because a little more salt always adds additional flavor, however unsalted butter also works. Make sure the butter is at room temperature before you bake with it. I recommend taking it out of the fridge an hour before baking these cookies. 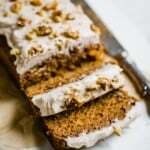 Sugar: regular granulated sugar is best in this recipe. Egg: you’ll need one egg, and it’s best if the egg is at room temperature before you bake with it. 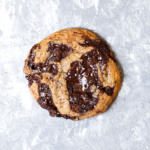 I think these cookies would work well with a ‘flaxegg’ if you want to make them vegan. Fresh lemon zest and juice: more tips on this below! Almond extract: a hint of almond extract brings out incredible flavor in these lemon cookies. Don’t skip it! Make sure to use parchment paper when baking: To make sure the cookies don’t stick to the pan, make sure you use parchment paper. 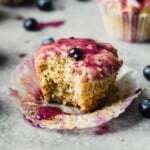 Use an electric mixer: It’s best to use an electric mixer for this recipe so that you can beat the butter and sugar together until it’s nice and fluffy. I love this hand mixer or this KitchenAid mixer, which is well worth the investment! Make sure your butter is softened to room temperature: I recommend taking it out of the fridge an hour before baking these cookies. Do not attempt to melt your butter in the microwave to soften the butter, if you do this the cookies will not turn out correctly! Make sure your egg is at room temperature: Simply run it under warm water for a minute before using it in the recipe to bring the egg to room temperature. 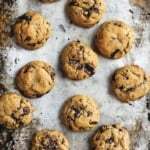 Allow cookies to completely cool before putting icing on them: If you are in a rush and want to speed up the process you can put the cookie sheet in the freezer for 10-15 minutes after baking. Use fresh lemon juice: make sure you use freshly squeezed lemon juice for this recipe. Do not use lemon concentrate, it’s too potent and sour. Don’t forget the lemon zest: the lemon zest is very important to flavoring these lemon cookies, so don’t skip it. Here’s the inexpensive zester I recommend. -Make lemon poppyseed cookies: If you want to make these lemon poppyseed cookies, simply add 1 tablespoon poppyseeds to the cookie dough. -Wait for the icing to completely harden on the cookies, then place them in a glass container in even layers. You can place parchment paper in between each cookie layer if you are concerned with cookies sticking to one another. -Cookies will stay good for 5 days at room temperature in cooler weather. If humid, I recommend transferring cookies to the fridge in a glass container after a day or two. 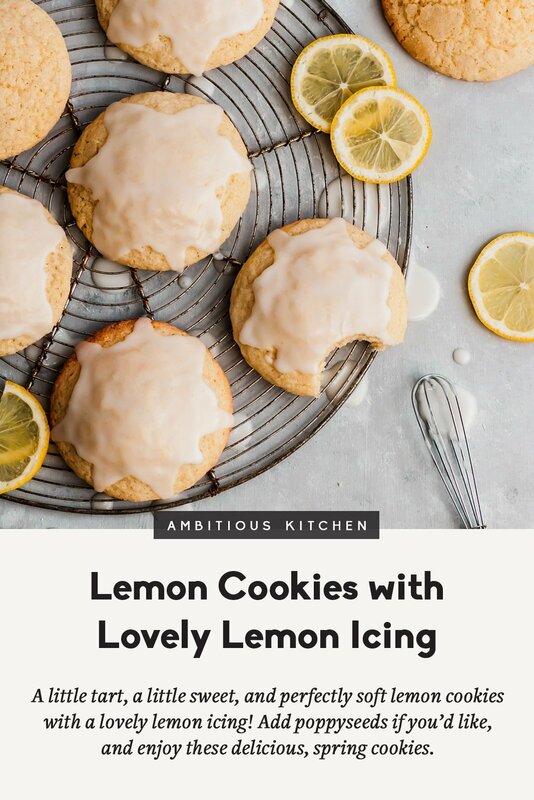 If you make these lemon cookies, be sure to leave a comment and rate the recipe below! 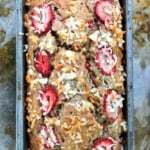 I’d love to hear from you and it helps encourage others to make the recipe too! Tart, sweet and soft lemon cookies with an outrageously delicious lovely lemon icing. Add poppy seeds to these cookies to easily make them lemon poppyseed cookies! 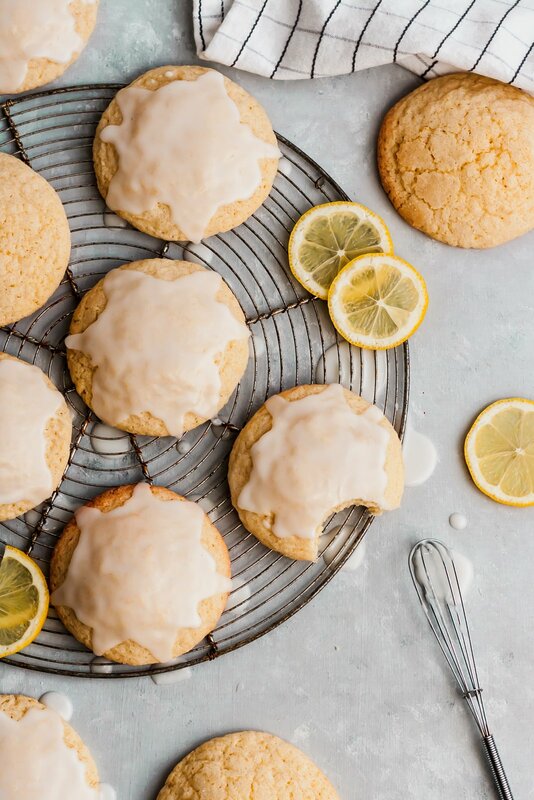 Lemon lovers will LOVE these cookies. Preheat oven to 350 degrees F. Line a large baking sheet with parchment paper. Set aside. In a large bowl, whisk together the flour, baking powder, poppy seeds (optional) and salt. In the bowl of an electric mixer, add in softened butter, sugar and lemon zest; beat on high for 2 minutes. Next add in egg and almond extract. Beat for 1 minute until well combined. (It’s SUPER important the egg is at room temperature. To achieve this, just run it under warm water for 1 minute). Slowly add in the dry ingredients and fresh lemon juice and mix on medium low speed until well combined. Use a medium cookie scoop to grab the dough, then use your hands to roll dough into a circle. Roll in sugar, then place on prepared baking sheet. Repeat, leaving at least 2 inches between each dough ball. Bake for 11-14 minute or until edges are barely golden brown. Remove from oven and allow to cool 5 minutes on baking sheet before transferring to a wire rack to finish cooling. Once cookies are completely cooled, you can glaze them. Make the glaze by adding powdered sugar, 1 tablespoon fresh lemon juice and almond extract in a medium bowl. Stir to combine. You may need to add in more lemon juice if it is too thick (start with a teaspoon at a time). Glaze should be somewhat thick. Spoon about ½ tablespoon of glaze to each cookie and use a spoon to spread around. Enjoy! Makes 12 cookies. *To make cookies dairy free: Feel free to use a vegan buttery stick, such as Earth Balance. To make cookies gluten free: I suggest using an all purpose gluten free flour such as Bob’s Red Mill 1:1 baking flour. I also think chickpea flour would work very well but you may get a different flavor. To make cookies vegan: Use a flax egg (1 tablespoon flaxseed meal + 3 tablespoons water) and a softened vegan buttery stick (such as Earth Balance). 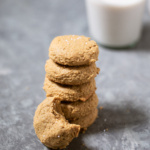 If you want to use coconut sugar in this recipe, I suggest only using it in the cookies themselves. Personally I think it overpowers the lemon flavor too much. Do NOT roll the cookies in coconut sugar; it doesn’t have the same consistency. 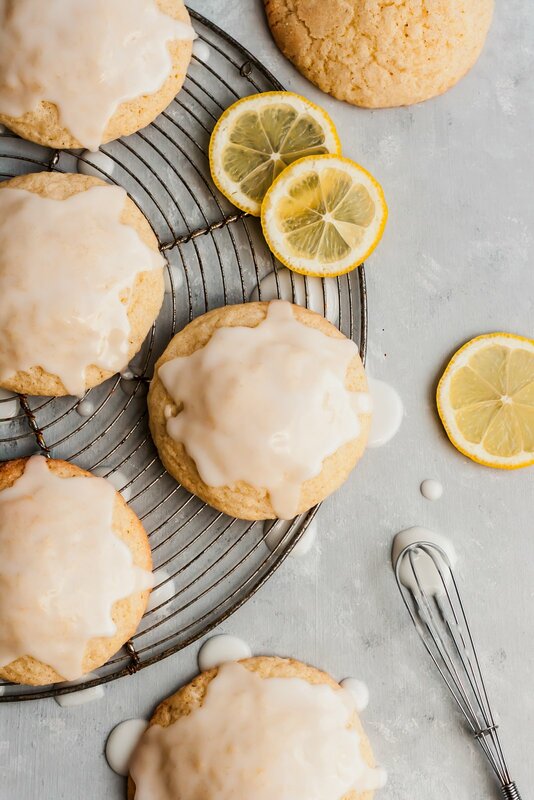 22 Responses to "Lemon Cookies with Lovely Lemon Glaze"
Lemon cookies are a perfect, refreshing treat! Agreed! One of my favs for spring. For gluten free is that the blue labelled bag or red? It’s usually light blue! Just look for the “1:1” on the front. I doubled this receive because who can only eat 12 cookies😄 Love them – perfect for springtime! Highly recommend. When I made my cookies I didn’t find they flattened out much from the dough ball, is there any way to fix this? Should I have flattened them slightly first? My fiancé is obsessed with anything lemon so I made these for him with the Bob’s Red Mill 1:1 gluten free mix – they turned out amazing!! I did everything else as the recipe states. I think these are MY new favorite treat!! Thank you so much for developing and I’m so happy I found the recipe. Keep ‘em coming!! So happy to hear that Jaclyn! They’re one of my new favs too 🙂 Glad you both loved them! Deeeeeelicous! The lemon flavor in these cookies is explosive! They are light and the perfect combo of sweet/tart! Just in time for spring! Yes!! Perfect for spring. Glad you loved them! Big hit at our dinner party! Thank you for this recipe and especially the thoughtful instructions. I made these when I needed a quick, crowd-pleasing dessert for a big group. They ARE made in a jiffy and EVERYBODY loved them. Bravo! You’re so welcome!! I’m glad everyone loved them 🙂 thank you for your comment!